It's hit me that in the closing in on 2 years that I've been blogging here, despite numerous calls out to numerous cocktails, I have yet to write about the plain old martini. As martini fans know, what makes them wonderful is they're plain and old--it's all about the bracing dip into icy waters that a sip of mostly high grade gin provides. My method didn't originate with me--at this point I don't remember where I borrowed it from, perhaps Luis Bunuel's fine memoir My Last Sigh, but its origin might as well be as murky as the cocktail's itself--but the sneaky part is simple. Get a lot of ice into your shaker. Wet that well with some dry vermouth (you can't go wrong with Noilly Prat), give that a good shake, and then drain. Yep, pour most of the vermouth out. Enough will stay a-glistening to your cubes and coat the shaker. Then add the gin and shake again. Strain into cocktail glasses, and do the good classic touch and dash once or twice with orange bitters (suddenly they are everywhere after decades hard to find). Add your olives and drink fast--there's no drink that loses its charm more quickly than a martini, as lukewarm gin is for bathtubs, not happy hour. When in doubt make them smaller and have a couple. That even gives you an excuse (as if you need one) to hunt for some vintage smaller up-glasses. As for the gin, taste around to find the flavors that most please you, for this is really the one-person play in the cocktail drama book and you don't want Adam Sandler in Krapp's Last Tape, do you? If you like something milder with a whiff of cucumber, there's Hendrick's. If you like it clean and clear, but with a subtle complexity, there's Bombay Sapphire. If you want the equivalent of a double IPA of gin, go with my usual favorite, Anchor Junipero. 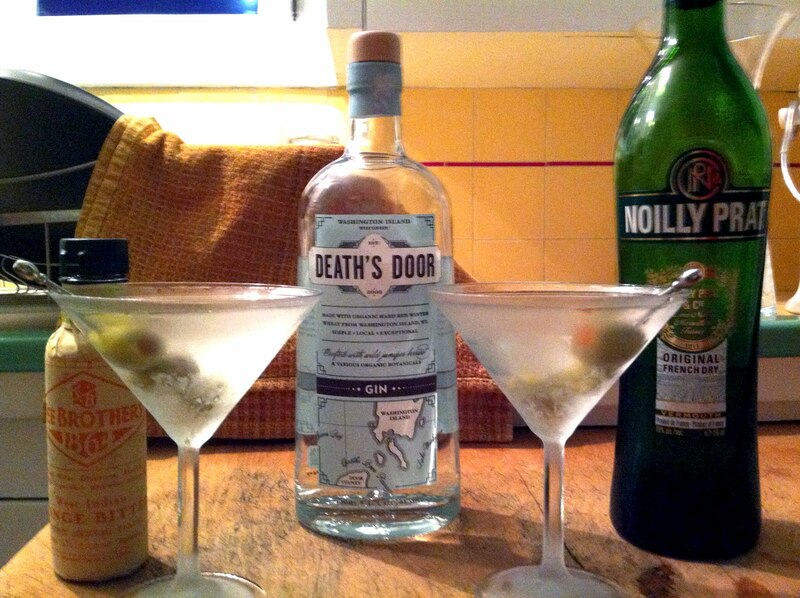 And now I've got another fun variation, pictured above, Death's Door, one of the few all organic gins available. While Anchor uses "more than a dozen" (how cryptic, or how sneaky a way not to say 13 and avoid freaking out the triskaidekaphobes?) botanicals, Death's Door keeps it simple and uses only three--juniper berries (of course), coriander, and fennel seeds. That gives this gin a laser focus on the juniper, smelling like a field of Christmas trees when you open the bottle. It finishes refreshingly citrusy, too. Simply put, place of origin tells you most of what you need to know--want an extravagant San Francisco gin, go Anchor, want the salt of the earth Midwest (Wisconsin) gin, go Death's Door.